LA JOLLA, CA—An army of diverse immune cells guards the lining of your intestine against invasion by bacterial pathogens. Once alerted to a toxic incident, some function like a cellular SWAT team to eliminate invaders before they cross the mucosal barrier to reach organs in the viscera. Among these are a class of white blood cells called Innate Lymphoid Cells, or ILCs. 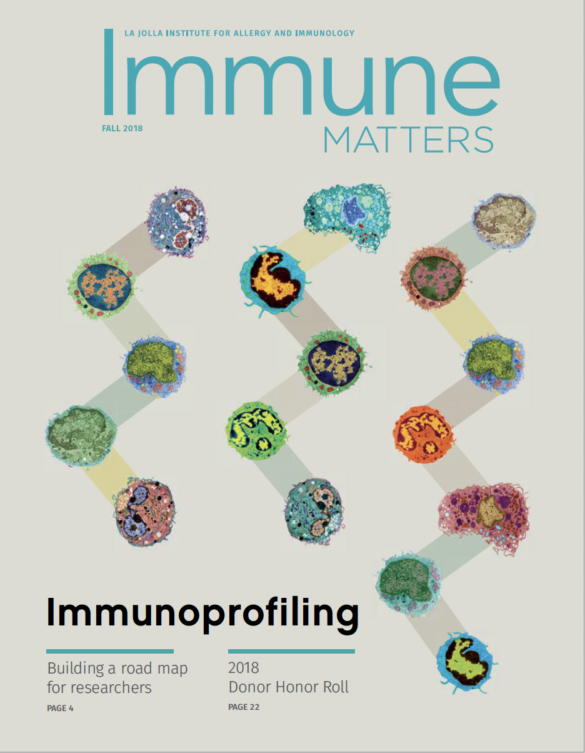 ILCs and the molecular signals that mobilize them are topics of a new study from the lab of La Jolla Institute for Immunology (LJI) investigator, Mitchell Kronenberg, Ph.D. That paper, published in the August 2018 edition of Cell Host & Microbe, reports that mice deficient in ILCs are vulnerable to lethal infection by the bacterial pathogen Yersinia enterocolitica (YE), which causes some forms of food poisoning. Moreover, activation by a cytokine called LIGHT, which is a member of the tumor necrosis factor (TNF) superfamily, is necessary for ILCs to mount an anti-bacterial response. This study reveals how ILCs rely on context-dependent activity of TNF family proteins to carry out indispensable roles in intestinal immunity. 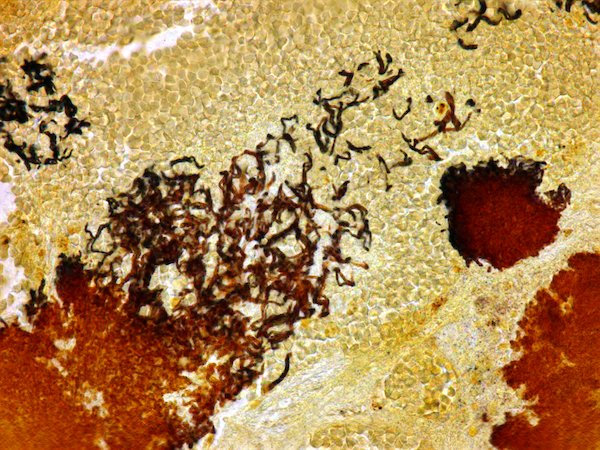 Mouse spleen with large areas of necrosis (stained dark brown or black) after oral infection with Yersinia enterocolitica. Credit: Dr. Gooyoung Seo and Dr. Zbigniew Mikulski, La Jolla Institute for Immunology. To study ILC function, his group administered YE orally to two groups of mice: normal mice, and mice genetically engineered to completely lack ILCs. ILC-deficient mice rapidly lost weight after infection, harbored high levels of bacteria in small intestine as well as spleen and liver (meaning that YE had breached the intestinal wall), and showed poor survival, many succumbing in the first week. By contrast, normal mice exhibited minimal adverse effects and handily cleared the infection. The researchers then experimentally transferred ILCs collected from normal mice into a new group of ILC-deficient mice and infected them with YE. Those mice exhibited few deleterious effects, confirming that ILCs are responsible for clearing the infection. And so it was. “Knock-out” mice deficient in either HVEM or a TNF protein that binds to HVEM called LIGHT, a protein also present in the gut, were as vulnerable to YE infection as mice lacking ILCs. This suggested the following scenario: following YE invasion, LIGHT protein switches on HVEM receptors displayed by resident ILCs, in essence commanding them to neutralize the infection. TNF family proteins participate in numerous inflammatory pathways, some protective, as described here, and others destructive. The family is complex, comprised of at least 20 activators (like LIGHT) of multiple receptors akin to HVEM. TNF signaling is also of significant interest to drug companies, and anti-TNF biologics with trade names like Humira and Enbrel appear nightly on TV commercials for autoimmune therapies. Goo-Young Seo, Jr-Wen Shui, Daisuke Takahashi, Christina Song, Qingyang Wang, Kenneth Kim, Zbigniew Mikulski, Shilpi Chandra, Daniel A Giles, Sonja Zahner, Pyeung-Hyeun Kim, Hilde Cheroutre, Marco Colonna, and Mitchell Kronenberg. LIGHT-HVEM Signaling 1 in Innate Lymphoid Cell Subsets Protects Against Enteric Bacterial Infection. Cell Host & Microbe, 2018. The study was funded by grants from the National Institutes of Health (P01 DK46763, R01 AI61516, and MIST U01 AI125955, MIST U01 AI125957; and S10RR027366), the Crohn’s and Colitis Foundation of America (CCFA-254582), the Uehara Foundation and the National Research Foundation (NRF) of Korea (2013R1A1A2057931and 2016R1A4A1010115).